A self-weighted traffic separator that can be used as a pedestrian and traffic barrier syste.. These water filled traffic separators offer strength and durability within its design. Can be .. Manufactured from Solathene™ HD and the system has been extensively trialled to ensure that it su..
Road Runner Traffic Separator Length 1095mm x Height 600mm Self Weighted 22.5kg, No need to s..
• Blow moulded HDPE blocs with strong durable hinge system and carry handle. • 1mtr long x 600mm ..
Traffic separators are a very simple and efficient method of helping control traffic flow. Our traffic separators are all quite similiar in style and how they link together, the only difference is the main body of the product and the size. The original traffic separator and also the simplest is the traffic log. 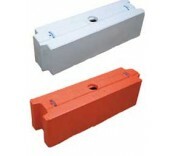 These separators are available in either red or white units and are 300mm high and 300mm wide and 1m in length. The are manufactured out of recycled material and are easliy linked together. They are very heavy duty (weigh approx 40 kilos each) but have two rope handles each to help them be manoeuvred. They can also incorporate a post and reflective plank in the top of the separator which can convert it into a pedestrian barrier. The next style of traffic separator we offer is the water-filled sytem. These are available in either 1m or 2m lengths with the height being 650mm and the width 550mm. They use either water or sand as ballast and are easily assembled on site and stacked for storage. Similiar to the traffic logs the water-filled units can incorporate a post and a reflective plank that will convert the system into an effective pedestrian barrier. The third style of traffic separator we supply is the latest style and incorporates many of the best features of the traffic log and the water-filled system, its called the Road Runner. This system is manufactured by Melba-Swintex and is easily linked together using tail pins. It has a heavy duty base manufactured from recycled material. It is this base that gives the system ballast and has two wheels on the back of the separator that makes the system easy to manoeuvre. The top part is manufactured from high density polythene and recycled pvc and the overall size of the product is 1095mm in length 600mm high and a width of 370mm. Each product weighs 22.5 kilos.